JobElephant is a high volume ad agency with an outstanding staff of experienced professionals. Combine this expert personnel with proprietary automation technology and you have an agency that can scale with any client of any volume. We have the capability to batch and upload hundreds of jobs at a time to over 100 of the most widely used media outlets. Regardless of the size of your institution, your jobs batch with those of our other clients; therefore, speed and efficiency are the same whether you place 1 job per week or over 100. Jobelephant’s customer portal (adcontrol.jobelephant.com) allows clients to directly access tearsheets (copies of placed ads), invoices and billing history, as well as submit jobs for quote requests, approve paid advertising and pay for ads once an invoice is received. All stages of the recruitment advertising process can be implemented, monitored, and confirmed through the customer portal. Our cPortal completes the circle of customer service at JobElephant, allowing clients the ability to access their orders 24/7. Feeds, Sweeps, Scrapes – whatever you want to call it, JobElephant has the technology to keep all of your job postings current every business day. 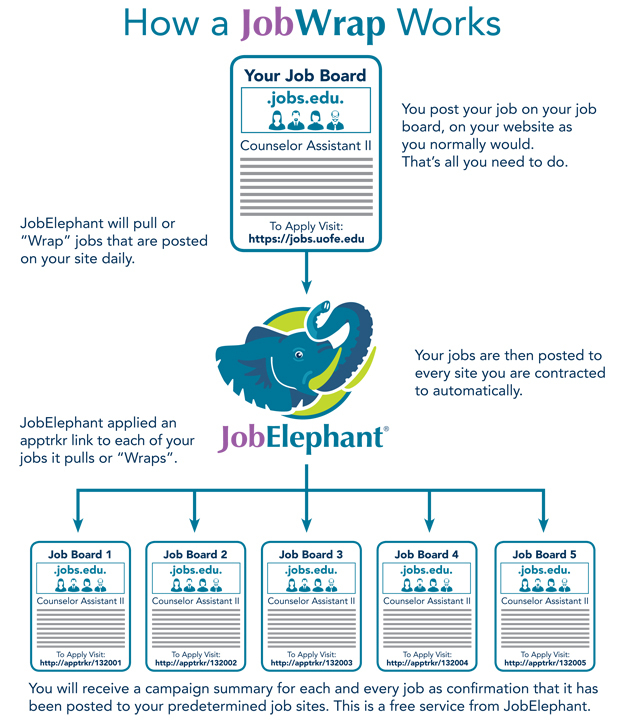 Every weeknight, our proprietary Job Wrap system imports all employment announcements from your career sites(s) or Applicant Tracking System (ATS) into the JobElephant Ad Control System in order to automatically identify new postings, edits to current postings, or deleted postings. The following morning, our team of experts (Ad Reps) manually validates the data for errors. Once quality control is complete, the the updated job listings are immediately released to all of the predetermined lists of job boards agreed upon between the client and JobElephant for reposting. The precise, automated “mirroring” with client websites coupled with the manual verification of data integrity ensures the accuracy of your postings while taking advantage of the speed of automation. For clients with more than one primary media resource for their recruitment advertising, this FREE service will also save considerable money by avoiding the fees charged by most job boards to set up a sweeping/scraping service, as well as those charged by ATSs for customizing software to work with external sites. Our Job Wrap requires no technological help from your ATS, Human Resource information System, or the job board media and will work with nearly all client websites. For you, it’s set it…and forget it. Get started by calling 1-800-311-0563. We’ll take it from there. To save you a tremendous amount of time, Jobelephant.com can wrap your job site once a day and then automatically post your jobs externally to any or all existing contracted job sites.